Are you dreaming for many years from a sailing holiday in Croatia? Put the dream into reality. The most beautiful coves, nature parks and national parks are waiting for you in Croatia. Sunja Yachting is over 20 years partner for yacht charter, boat charter and boat rental in Croatia, main basesin Zadar and Sukosan. Our team consists of passionate sailors and boaters. Ambitious, we have constantly worked on ourselves, in order to improve the quality we offer to you. Of course we also have motor yachts and catamarans in our charter program. Ask about our Fountaine Pajot Orana 44 - the catamaran for the very special sailing adventure! We work in a small family team - so we can guarantee you a truly personal and individual advice. In our team, everyone knows each other, and the channels of communication with the charter bases are short and unbureaucratic. Therefore in a case of unexpected truble, we can respond quickly and professional, so you can enjoy a carefree holiday on your yacht. In our booking centers in Germany and Croatia, we are always trying to find the right and perfect Charterboat for you. As same we love to advise you and help you with your decision and vacation planning. By charter insurance is the financial side of your yacht charter booking with us in good hands. We were in the 20 years existence in this way constantly enlarge our circle of our satisfied customers. The loyalty of our patrons, we honor with reduced charter prices. Of course we also have Yachtinvest experience. With us you can also get your own charter yacht on a safety and secure communication base. Ask for Yachtinvest-purchase charter! We know each of our yachts precisely because we are one of the few providers that are not only passionate sailors, but wait our own yachts and also maintain. Thus, we can assess the condition of a yacht itself. With us you do not just rent a yacht! Our boat charter service provides personal site on sailing area. All this at a very fair and reasonable yacht charter price!Our well-tended to and privately owned yachts are in excellent condition and are by standard fitted at a high level. Maritime Rescue Service, Sea charts, Harbor Manual, dinghy, complete Pantry equipment, GPS, etc. A swift and professional handover is also understood. Even with flights, we are happy to help! Our well-kept privately owned yachts presented to the charterer in excellent condition and are already fitted as standard on a high level: The yachts are all in a good condition, which leaves no wishes open. Like you want it. Sea rescue means sea-cards, port manual, dinghy, complete pantry equipment, GPS - plotter etc .. A swift and professional handover belong to us for granted. Also in the flight mediation we are happy to assist you. Do you allready know our Skippertraining? Why Croatia is so special for sailing? Sunja Yachting: Sunja Yachting: Of course, you can get on our sailing portal all useful tips for the perfect sailing holiday in Croatia. We present the sights, provide trip plans and send you to the most beautiful islands in the Croatian Mediterranean. Take a look at Yacht Charter Split Yacht Sukosan. Enjoy your holiday at the adria. The currently offer is our Katamatran LAGOON 450 SPORT TOP CROATIA in Croatia Sukosan. high seas yacht with a big point on comfort. Rent in now with our Last-Minute-Discount! 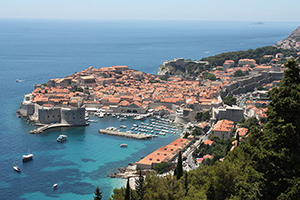 "Sail through the Croatia Islands and enjoy the beauty of the Croatian Mediterranean." Would you like to rent or charter a yacht? Search our large selection of charter yachts for your dream yacht. The choice of yacht charter can be selected using the cabin number and yacht manufacturers. Whether luxury yacht, sport yacht with a large pole or motor yacht for crunchy noise across the sea? With us you have the wide selection. Why the sailing region of Croatia is one of the most popular? Croatia, the very special sailing area is divided into Istria and Kvarner, Dalmatia and North Dalmatia and south Croatia. At the Croatian Adriatic find all boater a very varied coastline with many small islands and gorgeous coves. Each island with its own charm. The best known and largest islands are Krk and Cres. Discover the largest island collection, in the Adriatic Sea. Around 146 islands are spread over an area of 240 sqm sea surface. Quite easily, the Kornati islands from Zadar or Biograd from behind. Ask our skippers for a voyage plan! Charter Zadar, Charter Biograd or Charter Sukosan - use our long and deep experience in Croatia! 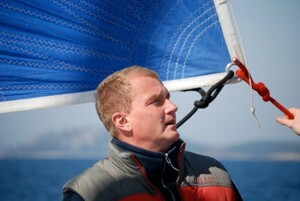 Are you looking for a skipper training in croatia? Every year from the beginning of the season until the end of the season we offer skipper training courses for sailing yachts of catamarans, then you will be able to handle optimally with your Charter Yacht. With our training trips you will be very well trained so you can enjoy a stress-free sailing trip on their own keel with your family or friends. We wish you a very happy holiday and thank you for your trust that you charter a sailboat with us. Sailing croatia - whether Istria and Kvarner, South & North Dalmatia or Southern Croatia. The Sunja Yachting Team is pleased to be able to show you with this voyage schedule a little insight into the beautiful dream world of the Croatian Adriatic. How you twist and turn it - whether the crew in the charter-center, Marina Veruda starts at Pula or on the island of Krk, trips through the sea lanes of Kvarner and Kvarneric are full of history and special experiences. Only the Bora could interfere. Called by the UNESCO World Heritage Site, as one of the most beautiful sailing areas in the world. Dubrovnik is a city in southern enclave of Croatia on the Adriatic Sea and surrounded on three sides by the sea. Dubrovnik is a city with a long cultural and eventful past. The marina Dubrovnik as a "must-see" skipper tip and destination for sailing. With a sailing yacht or catamaran yacht the sailing paradise is very easy to reach and even wunderful to sail. We as a yacht charter agency Sunja Yachting offer you a hundred percent safety for the payment of the charter price. 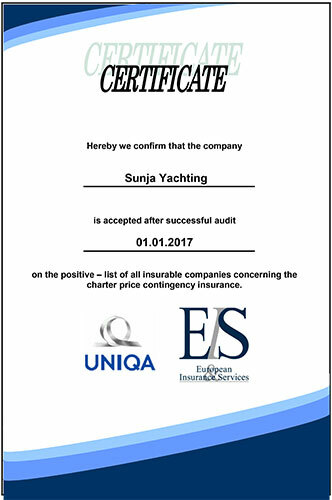 for this reason the UNIQA insurance stays with its name behind our yacht charter company sunja yachting. Yacht Charter without any risks with Sunja Yachting. deemed reputable form of travel price hedging. Every year we undergo the requirements again under strict examination the UNIQA Insurance and the EIS European Insurance Services. ... because it is an adventure in beautiful natural surroundings and crystal clear water. Alone on the beach or with a group in a city. Every day or every two days at a different location. So, as you wish. In a moment in a medieval city, in the other in the natural beauty of national parks on the Adriatic coast. The choice is yours. It is a holiday in which you can choose depending on your mood even where and how you spend your time. If you want peace and quiet, you can visit one of the numerous secluded little bays or a small fishing village. If you are more into party mood, watching the sunset from a seafood restaurant and then go to a beach party or dance till sunrise in a nightclub. Sailing can not be monotonous or boring. You can take it sporty and figure out the hang of hoisting a sail and binding tying knots, or leave the job just the experienced skipper and admire prefer nature and the waves of the sea. If you are traveling as a couple, there will be no shortage of romance! You can always and everywhere go swimming. And you might even luck and swim with dolphins, often follow the sailboats. Can you imagine a more romantic evening of as lying on the deck of a boat, under the starry sky? The Adriatic Sea and the coasts of Croatia provide the backdrop for one of the most stunning and unspoiled landscapes in Europe. The Adriatic (the "Mediterranean") is the ideal area for sailing. It is safe, has a lot of wind, sun and over 1700 islands, bays and cliffs that is worth discovering. The climate is warm and Mediterranean, and the water has in the summer an average temperature of 25° degrees. Moreover, it is in Europe a unique place to enjoy the underwater world. More information on the geography and the cities, you can find on the Croatia menu item. Why is sailing a passion? Experience the indescribable feeling of freedom while admiring the beautiful nature of the Adriatic. The feeling of the wind and the warming sun on your skin. The extraordinary sight of dolphins, playing around the boat and dancing. Variety and spontaneity. to be every day to another place, where behind every chapter awaits a new discovery. The experience of thrill and feel the spray caused by fast sailing in strong winds. Lie on the deck during the day while sailing and swim at night under bright starry sky. The calming sound of the ocean with no engine noise. Every day, swimming in crystal clear water. In mild rocking of the sailboat dream like a baby in the cradle! !